A goblin detective and a technology-tinkering troll set out to solve the mystery of the escaped cleaning slimes. When the school's cleaning slimes escape and destroy the schoolyard with their acidic ooze, all claws and tails point to Mr. Snag, the school's caretaker. Determined to clear Mr. Snag's name, Tank and Fizz dive into the case, only to discover that the goop under Rockfall Mountain runs deep. Along the way, the detective duo must outwit their eight-legged principal and survive an ancient war between high-tech janitors and spell-slinging wizards. Can Tank and Fizz find the real monsters behind the slime stampede in time to clear Mr. Snag's name? The Case of the Slime Stampede is the first book in the Tank & Fizz mystery series about two crime-solving monsters living under a mountain. 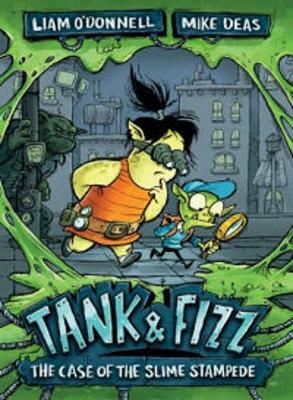 Stay tuned for book two, Tank & Fizz: The Case of the Battling Bots, coming Spring 2016. Liam O'Donnell is an author and educator who has created over forty books and graphic novels for young readers, including the Max Finder Mystery, Graphic Guide Adventures, West Meadows Detectives series. He was born in Northern Ireland and came to Canada when he was five years old. He studied media at Ryerson University and has worked on film sets in Canada, Ireland and the United Kingdom. Liam lives in London, Ontario. For more information, visit liamodonnell.com or follow him on Twitter @liamodonnell. Mike Deas is an author/illustrator of graphic novels, including Dalen and Gole and the Graphic Guide Adventures series. While he grew up with a love of illustrative storytelling, Capilano College's Commercial Animation Program helped Mike fine-tune his drawing skills and imagination. Mike and his family live on Salt Spring Island, British Columbia. For more information, visit deasillustration.com or follow him on Twitter @deasillos.